On Advent Sunday 2009, over 350 people packed St Lawrence Church to celebrate two new births. The creation of the new ʻParish of the Resurrectionʼ was the first of these which was born as a result of the joining together of the churches of All Saints, St Lawrence and St Peterʼs in Beech and the second the birth of The Greater Alton Project born as a result of the coming together of these same churches with Holy Rood in Holybourne and Alton Methodist Church in a local covenanted partnership to be known as the Greater Alton Project or GAP, which commits the churches to work together for the purpose of supporting mission and ministry in the greater Alton area. The service of celebration was led jointly by The Rt Revd Trevor Willmott, former Bishop of Basingstoke and the Revd John Hellyer Chairman of the Methodist South-East District. Local clergy and lay representatives of the churches took part in the service. A working party of Anglicans and Methodists, worked tirelessly for over two years on this, with the backing and support of the congregations, culminating in a series of unanimous votes taken in all the churches which gave the go ahead to this new venture in church co-operation. Since then, as “Anglicans and Methodists journeying together” in Alton we have been holding joint confirmation/church membership preparation classes and services, studying together, learning together and worshiping together as part of our commitment to this exciting venture. However, the Greater Alton Project is about far more than what Anglican and Methodist Christians get up to amongst themselves; for the vision that continually inspires and motivates GAP is to work together in order that they may better serve, minister and witness to the Market Town of Alton in North East Hampshire. Earlier this year we ran a very successful GAP Alpha Course with over 30 people attending (You will find details of this elsewhere on this website) and our second GAP Alpha course will begin in January 2016. Debbie Thompson, Helen Jesty and Jon Rook are our three Anna Chaplains who continue to spearhead and develop our work with older people in the town. There are many other examples of GAP cooperation as we seek to better serve our community from Service after School — “Messy Church”, to Coffee Mornings. At a time when many may feel that nationally the Anglican — Methodist Covenant is in the doldrums, we rejoice in all that is happening here in our market town where its flame burns bright! The Greater Alton Project — Anglicans and Methodists journeying together. This document records the “Covenanted Partnership” between the following churches All Saints’ Church, Alton, Alton Methodist Church, St. Lawrence Church, Alton, St. Peter’s Church, Beech and the Church of the Holy Rood, Holybourne. Following the signing of this document the parties listed above will become partners in a formal “Churches in Covenanted Partnership” to be known as The Greater Alton Project — Anglicans and Methodists journeying together. and to welcome opportunities to continue to work together with other local churches. The Greater Alton Project — Anglicans and Methodists journeying together — Confess our faith in Jesus Christ as God and Saviour according to the scriptures, believe that God calls us to be one in Jesus Christ by the power which the Holy Spirit gives, admit that our divisions are a hindrance to the unity which God wills for us, and repent of all that is sinful in those divisions that hinder the mission of God in which we are called to share. We give thanks for the ongoing life of ecumenical prayer that has brought us to this point. We wish to embark on a journey into that fuller unity which Christ wills for His church not yet knowing what form that unity may eventually take but setting out as pilgrims together not for the sake of the church, but for the sake of the world. The geographical area served by the Partnership is the greater Alton area comprising the areas covered by the Parish boundaries of: All Saints’ Church, St. Lawrence Church and The Church of the Holy Rood, Holybourne. The initial term is seven years from the date of signing. In support of this Partnership, our respective denominations commit themselves to consult mutually over appointments of clergy and ministers serving in partnerships. 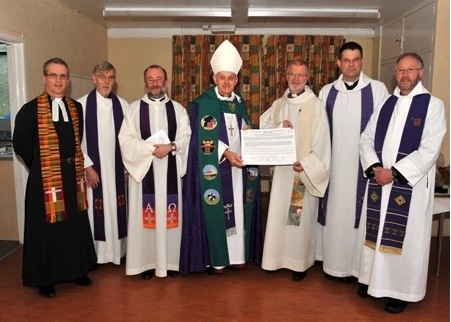 Churches Together in Hampshire and the Isle of Wight, as the designated Ecumenical Sponsoring Body, commits itself for its part to support the “Churches in Covenanted Partnership” created by the signing of this document and promises to assist the parties in a review of their commitments and of the progress they have made on a seven-yearly basis or earlier on request. As a result of our “Covenanted Partnership”, we commit ourselves to work together in mission, ministry, service and worship and in particular, through the following specific initiatives: The Simeon Chaplaincy, Chaplaincy to Alton College, a Youth and Children’s worker, new and additional patterns of worship and further developments and opportunities as they arise.